Home » archive post » Alliance of Southeast Annual Gala!!!! 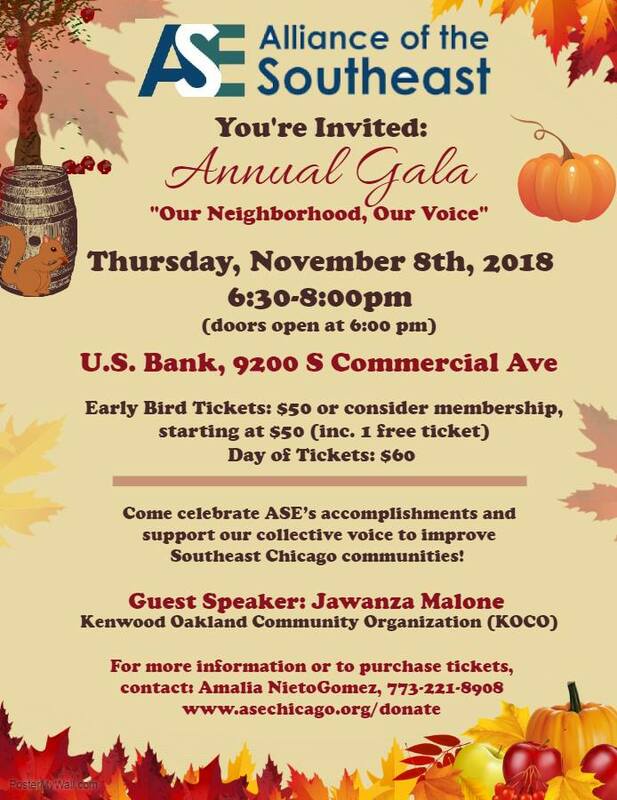 Come celebrate ASE’s accomplishments and support campaigns to benefit Southeast Chicago! Your investment will help residents and activists work for positive community change, from our work to increase neighborhood safety to establishing a youth council to ensuring developments- like the South Works site- benefits local residents via employment and training opportunities, access to affordable housing, and environmental protections and sustainability. You will help bring about improvements for our neighborhood and opportunities for residents. The Alliance of the Southeast (ASE) is an exciting group on Chicago’s south east side. Now 8 years old, ASE is a group of organizations, businesses, community leaders, and individuals who have come together to define and address community problems as they see them. ASE is all about community members finding and developing their voice and organizing to speak with ONE, STRONG, POWERFUL, VOICE!! Gym Showcase at Calumet Park District. Candidate Forums 5,7, & 8 Ward Hosted by the Neighborhood Network. Algebra Enrichment at Avalon Library.